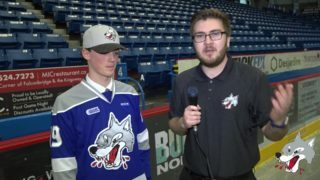 The Sudbury Wolves welcomed TROY TIMPANO and the league leading Erie Otters to the Sudbury Arena on Friday night for a special Remembrance Day game. Despite battling hard throughout the game and giving the fans in attendance lots to cheer about, the Wolves fell by a very close 2-1 final. The Sudbury Wolves took time prior to puck drop to pay tribute to those who have served and continue to serve our country. The fans gave our veterans a standing ovation to show their appreciation. 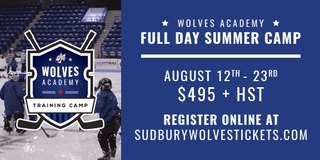 Early penalties for too many men on the ice and a delay of game forced the Wolves on their heels in the first period. Bowman was the busier goaltender in the first period, making key saves to keep the game tied at 0. RYAN VALENTINI and REAGAN O’GRADY both had great chances in front of TIMPANO, but could not solve him. 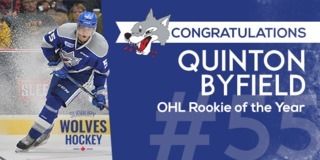 The Wolves and Otters went into the dressing room tied with no score and shots on goal 7-2 in favour of the Otters. The Wolves picked up the pace in the second period outshooting the Otters 17-13. MACAULEY CARSON who scored first, beating former Wolves netminder TIMPANO and put the Wolves up 1-0. 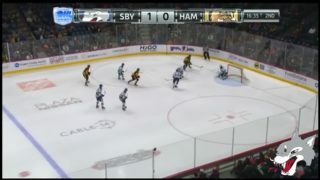 Four minutes later, Otters KYLE MAKSIMOVICH made a drop pass to DEBRINCAT who made no mistake as he beat BOWMAN to tie the game at 1. It was a busy end of the second period for the referees as they handed out three minor penalties, one five minute major and two ten minute misconducts. Each team received three respectively. Shots on goal at the end of the second period were 20-19, in favour of the Otters. Only 23 seconds into the third period the Otters scored to take a 2-1 lead. Three back-to-back penalties gave the Otters a 5-3 man advantage that the Wolves were able to successfully kill off. 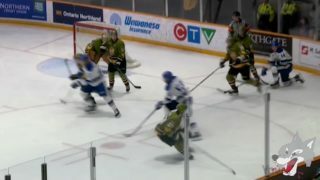 In the final minute of the game, O’GRADY had an excellent chance, merely missing the net. CAPOBIANCO made a beautiful diving play to stop an empty net goal but that would do it for the game. The Wolves fell by a close 2-1 final with shots on net 38-25 in favour of the Otters. 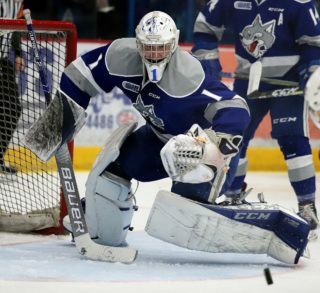 The Wolves will hit the road Saturday to continue their 3 – in – 3 weekend when they visit the Niagara IceDogs at 7:00pm. They will wrap up the weekend on Sunday at 6:05 when they visit the Oshawa Generals.